Heat oven to 350°F. Spray 8-inch square (2-quart) glass baking dish with cooking spray. In 12-inch nonstick skillet, melt butter over medium-high heat. Add stir-fry vegetables. Cook 1 to 2 minutes, stirring occasionally, until tender. 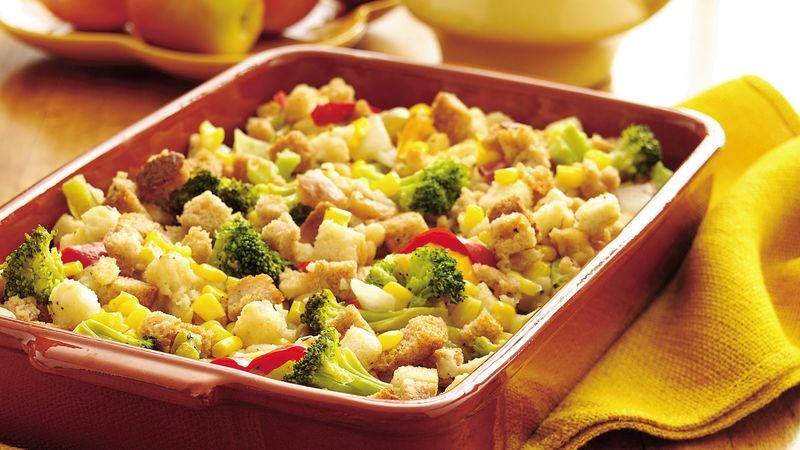 Stir in broccoli and corn. Cook 2 to 4 minutes, stirring occasionally, until vegetables are thawed. Stir in broth. Heat to boiling; remove from heat. Stir in stuffing cubes and thyme. Spoon into baking dish. Cover with foil; bake 25 to 30 minutes or until thoroughly heated. Don't have the bell pepper stir-fry on hand? Use 3/4 cup each of chopped bell pepper (any color) and onion.